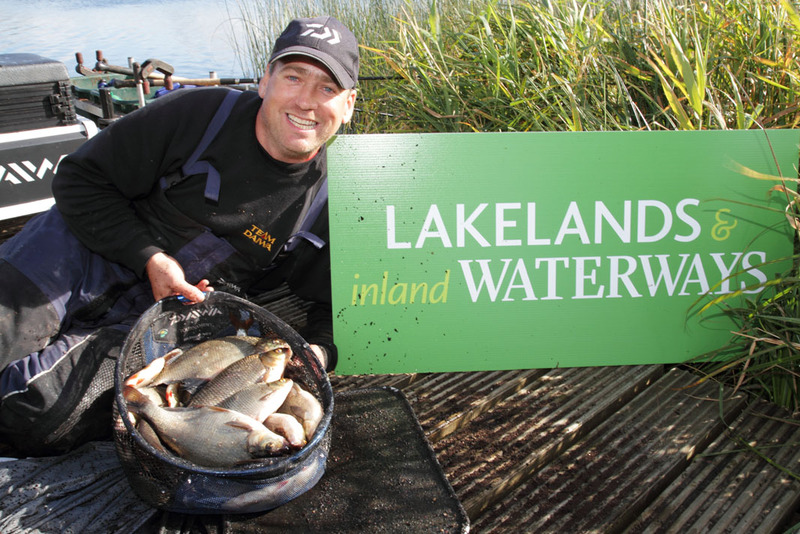 At the end of a week of incredible fishing, full of twists and turns, Northern Ireland/Republic of Ireland pair, Philip Jackson and Cathal Hughes, retained their crown as Lakelands and Inland Waterways World Pairs Angling Champions. Holding off a strong challenge from Preston Innovations England Feeder Team Internationals, Steve and Phil Ringer, the Irish duo slammed an amazing 47.920kg on the scales. Their last day performance capped a week where weights eclipsed the previous year. Over the course of the week, there were twelve weights in excess of 30kg (66lbs), capped by Cathal Hughes’ 40.180 from peg 12 on the River section at Upper Lough Erne on Crom Estate on Wednesday. Client Services Manager of Failte Ireland, Colm Breheny addressed the closing ceremony. Combining rivers and lakes of the Erne system, the Shannon-Erne Waterway and the Shannon Navigation, the venues for the World Pairs Angling Championships are in some of the most ruggedly natural settings to be found in the Republic or the UK. The Lakelands and Inland Waterways initiative is a collaboration co-chaired by Failte Ireland and Waterways Ireland, with cross-border membership from Fermanagh Lakeland Tourism, Northern Ireland Tourism Board and Tourism Ireland. Promoting the many activities that are carried out in the beautiful Lakelands region is the remit of the partnership, not only fishing, but other water-based activities, plus sightseeing and cultural interest. Robin Morley, Sales and Marketing Director of Daiwa Sports gave an address in which he expressed thanks for the sponsorship that Lakelands and Inland Waterways put into the World Pairs event. By putting £8500 worth of tackle prizes and the Daiwa Cup into the individual event, the Scottish-based company continue to follow up on Robin’s pledge in 2012 to support the event for at least five years. To answer the congratulations and thanks from the various dignitaries at the closing ceremony, Kevin Locke called on 1989 individual World Champion Tommy Pickering to address the audience on behalf of the anglers. The presence of a large number of the competitors is down to Tommy’s promotion of the event on fisheries and matches in the UK and Europe. In his typical proud, patriotic way, he spoke at length about his feelings for the Lakelands and Inland Waterways World Pairs Championships. ‘It was good last year, this year it’s fantastic. ‘One of the biggest changes is in the strength of angler fishing. Every day, at my peg, I looked down the line of anglers and saw quality. We had two of the three best match anglers ever fishing this event in Bob Nudd and Kevin Ashurst. ‘Although it was a serious match, we had a great laugh every day. We met wonderful people in the towns and villages where we stayed. Daiwa and Ringer Baits backed Steve Ringer was one of the big names drawn to fish the Lakelands and Inland Waterways World Pairs Angling Championships. With brother Phil as his partner, he came to take on some of the best match anglers in Europe on venues and in a country he had never fished before. Unluckily, he fell just short of both pairs’ and individual wins, picking up second place in both. Steve spoke about his visit. ‘It’s been fantastic. Phil and me have definitely learnt that the fishing here rewards anglers that work hard. The weather over the winter and into this summer played a big part in the fabulous fishing. Even during the week of competition, the weather stayed quite mild for the time of year. Many local people thought the sport has been much better this year thanks to a cold winter and warm, dry summer. Gabriel Owens, who volunteers for the Civil Defence team, spends time out in boats filming underwater. He has also guided anglers to the Lakelands region for more than twenty years, and had this to say. ‘The water clarity has lead to an explosion of roach/bream hybrids, which makes for consistent angling. The big bream are still in the lakes, but they tend to feed at night now. Zebra mussels have been a problem in Ireland for some years now. It is believed they arrived in Lough Erne in the mid 1990s attached to a boat. The rise of canals in the late 19th century precipitated their spread. They filter feed, and thus clean the water excessively. This leads to huge plant growth compared to previously. Not only is the increased weed a problem for anglers, the mussels themselves are notorious for snagging swimfeeders. The sharp-edged shells cut through line and the beds of mussels form a formidable barrier against twitching the feeder to induce a bite. Zebra mussels are a native of Russia and breed prolifically. Even more of a worry is the arrival of a new bivalve called the Asian clam. Although Zebra mussels have led to large weed growth, they have not adversely affected the suspended food supplies for fish. The Asian clam, however presents the prospect of denying the microscopic food that hatchling and juvenile fish need. Both DCAL and Inland Fisheries Ireland arranged for net dips to be present at every draw location. Anglers received a wrist band once they had dipped, and were only allowed to draw a peg on production of the day’s band. Arnold Donnelly and Seamus McDermott were the section stewards on hand at Kiltybarden Lake when angler Mark Williams had a heart attack on peg 2. They were observing the match from the Inland Fisheries Ireland pick-up, in the venue car park, when an angler ran up to them. He was speaking to ambulance control, but passed the phone over to Arnold, who could give directions. Local paramedic Patrick McGreevy and his partner Shane O’Gara arrived and took their place in the chain of events that saved Mark’s life. The paramedics then drove towards Carrick on Shannon, where they met the air ambulance and Mark was taken to Galway University hospital. Within two hours he had been fitted with two stents, had a major blood clot dispersed and was drinking a cup of tea in his bed. Mark paid tribute to all those who played a part. Cheers rang around the closing ceremony when Mark walked in the room, accompanied by paramedic Patrick. Mark’s two close friends Stephen and Fiona Beeby were on hand to keep make sure he wasn’t overwhelmed by the occasion. The World Pairs Angling Championships continues to spread its reach into other countries outside Ireland and the UK. Entrants from Germany, Holland, Belgium, Lithuania and even Australia lined up on the banks. Although the angler from Oz was Irish ex-pat Dara Finnegan, and he is now planning to return to the land of his birth. Rudiger Hansen, was the top finisher of the German visitors. His 63.330kgs left him in 43rd place at the end. Marcus Billen is a regular visitor, and finished strongly in 64th place with 57.410kg thanks to a last day 16.560 of quality pole caught fish next to Cathal Hughes. Ron Van De Voort, from Holland was the best placed angler from outside the UK and Ireland. His 34th place with 66.430kg was helped by a nice catch of bream on Day One on the River Shannon. 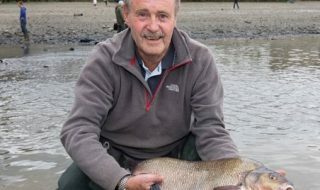 Ron has been coming to Ireland to fish two festivals every year for 15 years and the World Pairs Angling Competition is firmly fixed in his diary now. News of the Lakelands and Inland Waterways World Pairs Angling Championships was spread across the globe via social media, websites, radio, TV, magazines and newspapers. Not everyone had good access to one of those sources, however, and keen to keep tracks of events were Drennan Team England managers, Mark Downes and Mark Addy. 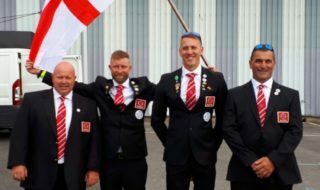 They were in Poland, preparing for the Senior Men’s World Championship competition, but called World Pairs organiser Kevin Locke every day for updates. 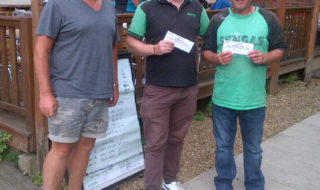 Mark Addy had a special reason to keep tabs on results, as son Lee finished in third place with his partner Paul Keeley. Paul finished in 9th position individually, and Lee was 14th. Within half an hour of the final day’s finish, Kevin Locke knew that Cathal Hughes and Philip Jackson had retained the title they won in 2012. Kevin sent a text message to Mark Downes, who was in Poland, to give him the top three places and then went to the Bush Hotel in Carrick on Shannon to prepare the venue for the evening’s presentation. As he walked into the hotel, Daiwa Sports Managing Director, Robin Morley walked out of reception and asked if he had heard the news about the winners. Kevin said he knew, but wondered how Robin had found out. The world of mass communication meant Kevin’s text went to Mark Downes in Poland, who told Nick ‘Ginger’ Howell, Daiwa Area Sales Manager for Ireland, who sent a text to Robin Morley in Ireland, who could have simply asked Kevin in the first place. 11.590kg (25lbs) of silver fish would be a nice day’s fishing for anyone, but when you can get it every day for five days, it is incredible sport. That’s what has been experienced in the 2013 Lakelands and Inland Waterways World Pairs Angling Championships. With 7418.590kg (14,985lbs) of hybrids, roach, perch and skimmers weighed in over the week, it has lead to many of the competitors calling it their best week’s fishing in years. Daiwa Cup individual champion, Cathal Hughes led the field with his 40.180kg (88lbs) of hybrids and roach from peg 12 at Crom River section on Wednesday. He said, ‘it was the day I realised you need to rest the feeder line to keep the hybrids coming.’ By swapping to the pole after three or four hybrids, he ensured the shoal never got spooked. A few roach on the pole line would come very fast and then he could go back on the feeder for another burst of hybrids. World Pairs Angling organiser, Kevin Locke, said, ‘it was a brilliant success. The averages are the best weights have been for years. I can’t remember when anglers have averaged nearly 12kg a man each day on a festival. ‘Our organising team stayed near Ballinamore, and we used the town as the hub. They have welcomed us with open arms and really embraced the event. Patrick and Julie at The Old Rectory were perfect hosts and kept us sane when the pressure was on. ‘We are so pleased that Lakelands and Inland Waterways continue to sponsor and support this event. Alongside Daiwa Sports, they are responsible for drawing such a high class field to compete in this beautiful area. ‘Michael Fitzpatrick was on the bank every day as the match referee, to oversee disputes. He, and the stewards and fishery teams supplied by DCAL and Inland Fisheries Ireland, all contributed to make the whole week run as smoothly as possible. ‘I want to mention Helen Rainsford and Steve Lockett. They both put in hours on the computers each night after they had been out taking photos and checking that everything was going well for the anglers all day. Former World Individual silver-medallist, Willie Wheeler was keen to fish the event, but had to run his new tackle shop in Ballyconnell to cater for the daily draws at the Angler’s Rest Hotel. For anglers in Enniskillen, Fishing Tackle and Bait was on hand despite owner David Burleigh being in Poland on international duty for Ireland at the World Championships. In Ballinamore, local legend Gabriel Owen left wife Dee to look after those who came to The Forge for supplies. This shop is an institution in angling circles, with its haphazard displays and curious mix of floats and plumbing supplies. Usually in the same boxes. Dee and Gabriel insist they know exactly where everything is, so once you have taken a look, it’s probably best to ask for what you want. It certainly is the ultimate in carrying kit to your peg. Sadly, most venues in Ireland require the old fashioned method of carrying everything over slightly uneven terrain. Equipped with indicators, lights, a hooter, mobile phone charger and even refrigerated buckets for bait, is great for use on commercial fisheries.